Photographer: David Sims. Model(s): Birgit Kos. Source: Interview Magazine. Stylist: Karl Templer. Makeup: Lucia Pieroni. Hair: Duffy. I dispel the anarchy of archaic notions that speak to me as if I am not here… as if I am not there… as if I am merely what I wear. Depth is met by my ability to hold my tongue. A single notion that I doth to share as I bring forth my soul to bare. To speak not when spoken to but when inspired to truly care ~ I am a soldier of silence, a fighter for fair. Art waits for no woman as it slowly works to transform itself. To become but one with the other is to become one with truth. A powerful voice is to set to sing while still maintaining a choice to speak. Tweaking turning wishing to be transforming into a tragedy. Before our eyes beauty but breaks, into tiny pieces of potential. Artistry is the answer my friend. it is a story without end.. come to my corner and do see life’s many unravel it’s mystery. Birgit Kos bleeds beauty out of every pour of her being as she begs for silence with every blink of her eye. What better than a bright color to hide the sadness of society. 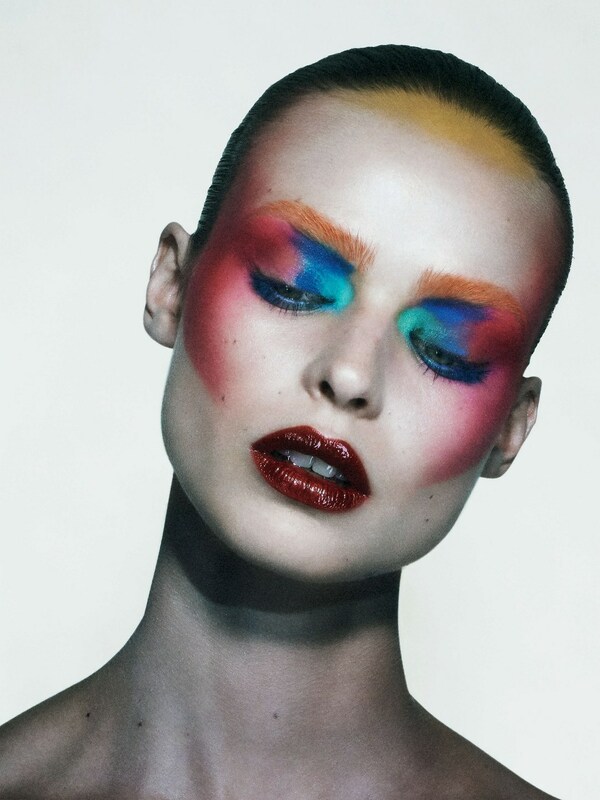 A cacophony of chaos blends with blinding beauty, as Lucia Pieroni unleashes the music of makeup. Rich colors caress the skin like so much boldness that bursts from within. Lurking behind these sad eyes there lives a truth unbeknownst to many but understood my most. The Beauty of the Bird Becomes as exotic shades touch every inch of skin. Bleached brows beg to be seen as one eye is purple and the other is teal/green. Hues of blue, yellow & orange bleed into the hairline, as orbital wings take on dramatic definition. A wild bird that’s ready for flight, beckoning free, this emotive creature cries with misty-blue eyes. Scintillation stirs in the night turning amber eyes into a brilliant sight. We are no longer looking at mere features, we are now peering into the future of the face. Oh Fair Maiden but with Me I Say I’m Not One to Bargain My Life but Away, In the Midst of Madness Comes the Folly of Fortune. Birgit Kos in “No Filter” by David Sims for Interview Magazine, for March 2018. Yellow, Blue & Red Lines the Scalp, Holding Back All Your Tears… Colors Caress the Skin with Wisdom That Marks the Passing Years.